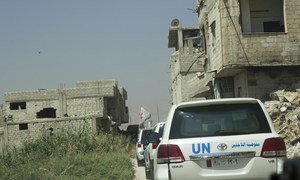 Deeply alarmed by the escalating violence in Syria’s east Ghouta, the United Nations has reiterated a call for an end to hostilities so that the sick and wounded can be immediately evacuated and humanitarian aid deliveries can reach those in need. “I don’t think we can let things go on in this horrendous way,” he urged, explaining that an estimated 700 people in the town, near the Syrian capital, Damascus, need urgent treatment that cannot be provided there. Since the Syrian Government and their allies escalated their offensive against opposition-held east Ghouta on 4 February, there have been more than 1,200 civilian casualties, including at least 346 killed and 878 injured, mostly in airstrikes hitting residential areas, according to reports documented by the Office of the UN High Commissioner for Human Rights (OHCHR). The Office, however, underscored that the figures are “far from comprehensive” and represent only those cases it has managed to document in the midst of the “chaos and destruction” in east Ghouta. Furthermore, only one humanitarian convoy has been able to make its way to the war-ravaged city since November last year, bringing to one of its enclaves desperately needed but overwhelmingly insufficient food and medical supplies – enough only to meet the needs of 2.6 per cent of the population in need. Also on Wednesday, the UN human rights chief also appealed to the international community to act urgently to save lives. “How much cruelty will it take before the international community can speak with one voice to say enough dead children, enough wrecked families, enough violence, and take resolute, concerted action to bring this monstrous campaign of annihilation to an end?” the UN High Commissioner for Human Rights, Zeid Ra’ad Al Hussein, said in a statement. “International humanitarian law was developed precisely to stop this type of situation, where civilians are slaughtered in droves in order to fulfil political or military objectives,” he underscored, reiterating his plea to the international community to ensure accountability for the ongoing violations, many of which may amount to war crimes. The humanitarian situation of civilians in Syria’s east Ghouta is spiraling out of control, a senior United Nation aid official has warned in the wake of escalating conflict which resulted in more than 40 civilian deaths on Monday alone.